On May 6, 1859, John H. Gregory followed Clear Creek upstream looking for gold. As he pulled a low tree branch out of the way and began to pan the creek, he discovered what was later called the “The Gregory Lode”. Located in a gulch between what later became Central City and Black Hawk, he staked the first of many mining claims in the vicinity. Immediately prospectors flocked to the region and within two months, the population grew to 10,000 people seeking their fortunes. The Clear Creek Mining District was so rich with ore it became known as the “Richest Square Mile on Earth.” Gregory’s discovery is commemorated by a stone monument at the eastern end of Central City. 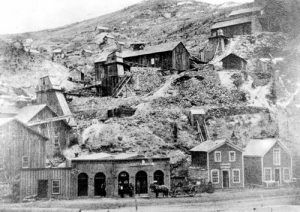 Other gold deposits were found in surrounding gulches and several mining camps sprouted up, including Springfield, Bortonsburg, Missouri City, Nevada City, Dog Town, Eureka, Russell Gulch, Lake Gulch, Black Hawk Point, Chase’s Gulch and Enterprise City. By the middle of July 1859, between 20,000 and 30,000 people were living in and around Gregory Gulch. There are two popular stories about how Central City was named. The first involved William N. Byers, founder of the Rocky Mountain News, who pitched his tent squarely in the center of the mining district in June 1859. Supposedly, he suggested that a town be laid out in that vicinity and since it was about halfway between Nevada City (Nevadaville) and Mountain City, it should be called “Central City.” The second is of a miner’s supply store, which was in the same area and was called the “Central City Store.” Either way, Central City was born — its official name: The City of Central. In late September, the first snow began to fall and most of the miners returned to lower elevations; however, a census taken just the next month revealed that nearly 2,300 men were still in the gulch area. During the winter of 1859-60, many new gold discoveries were made throughout the mountains and by February, miners were beginning to return. During that month, there was “a report of the discovery of a six-pound nugget near Gregory’s.” The discoverer was offered $16 per ounce for it but refused to sell. Also in February 1860, the first steam engine was assembled in Mountain City. It was used to produce shingles and was ready to crush quartz as soon as the mines would begin delivering ore. This engine cost $1,500 when it was purchased at the foundry in Chicago in late 1859. In March 1860, it was sold at Mountain City for $15,000. On April 25, 1860, the Rocky Mountain News reported, “The emigration is coming in at the rate of over one hundred men each day, and constantly increasing.” Just a little over a month later, they reported that the emigrants were coming in at the rate of a thousand a day. In June 1860, The Western Stage Company began running daily stagecoaches from Denver to Mountain City – the ride taking seven to eight hours. Only one year earlier, it had been a three or four-day journey. During the summer, the population around Gregory’s Diggings began to stabilize. In 1860, the United States Census listed Central City at 598, Mountain City 840 and Nevada City 879. About 5,000 people were in the immediate area and 34,000 in the mining region. By August 1860, the easy pickings were over and mining for gold became more difficult. As the depth of the mines increased, extracting gold from the ore became more complex. Due to the primitive technology, as little as 1/3 of the assayed amount of the ore was recovered. Other problems contributed to an economic slowdown in the area, including the Civil War and frequent Indian attacks on wagon trains crossing the Plains. The miners were becoming a rowdy bunch and in 1861, Central City recorded 217 fistfights, 97 revolver fights, 11 Bowie knife fights, and 1 dogfight. Amazingly, no one was killed. Central City became the county seat when Gilpin County was organized in 1861. The Territorial legislature granted a city charter to the City of Central in March 1864. This was 12 years before Colorado achieved statehood in 1876. In 1865 Nathaniel P. Hill, a Professor at Brown University, began studying the problem of extracting gold from the sulfide ore. He developed a smelting process that rid the ore of most of its impurities, producing a concentrate of copper, gold or silver. The concentrate then had to be separated and refined. In 1867, Hill began operating the Boston & Colorado Smelting Company in Black Hawk and mines began shipping ore to the smelter for processing. The concentrate of copper, gold, and silver was then shipped to Swansea, Wales (over 7,000 miles away), where the metals were separated and refined. As a result of this smelting and concentrating process, the district was “booming” again by early 1868. This “boom” resulted in extensive construction in Central City during the summer of 1868. The Daily Miner’s Register of June 16, 1868, noted that: “No less than eleven brick storehouses will be put up on Main street this summer. Hurrah for Central City.” Two of those brick storehouses, built that year, survived the fire of 1874 and are still standing. They are the north half of the “Roworth Block” on Main street and the “Seavey Block” on Spring Street. 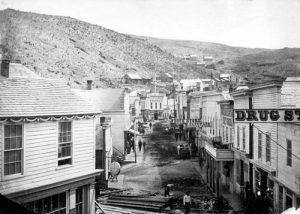 In 1870, the population of Central City, Black Hawk, and Nevadaville was about 4,000 – the same as Denver. The 70’s provided many events of significance to the City of Central. The city had become the most important city in the territory and by 1871; the settlement boasted 13 blacksmiths, 5 boarding houses, 10 butchers, 1 dentist, 4 drugstores, 12 grocery stores, 18 lawyers, 7 physicians, 11 shoemakers, and 5 tailors. I have the front page of the Central City, Colorado Weekly Register-Call newspaper printed on Friday, December 29,1893. It is for sale on eBay this week. Someone may be interested in this historic paper.